Home » ALP Exam 2018 , RRB , RRB Railway » RRB Railway Exam Date 2018 – जानिए Group D & ALP 2018 परीक्षा कब होगी ? 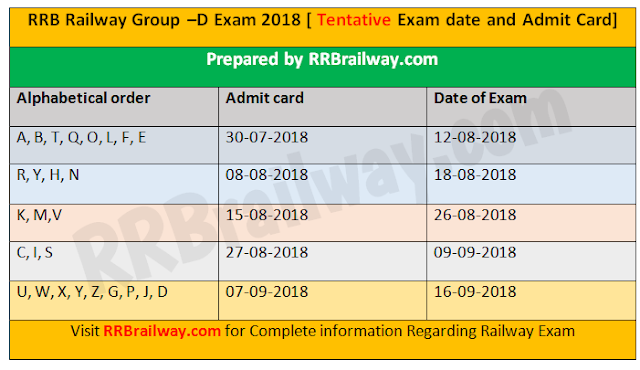 RRB Railway Exam Date 2018 – जानिए Group D & ALP 2018 परीक्षा कब होगी ? Hello friends, As we know more than two months have passed since the notification of RRB Railway 2018 ALP & Group D recruitment has released. More than 3 crore aspirants have applied for this recruitment, in which 2.37 crore applications were found valid. Those who have submitted the application are waiting for the exam date of RRB Railway . Large number of applications have created a lot of challenge to RRB. According to us this is the main reason for delayed the date of the examination of RRB Railway 2018. According to the most of newspaper viz. hindustan, dainik jagron, and other prominent newspaper are saying that RRb Railway group D exam 2018 is expected to start from 12th August. But is not officially declared. The Board has not officially shared any information about the Exam Date of RRB Railway Group D & ALP 2018. जानिए Group D & ALP परीक्षा कब होगी ? As you know more than 50 lac applications have been submitted for ALP or assistant loco pilot. Due to huge number of applications the process for both examination (RRB Railway ALP & Group D 2018), the date of examination is being delayed. According to source the examination of RRB Railway ALP or Assistant Loco Pilot will be held by the end of August 2018. However, the Railway Recruitment Board is not making any comment on this subject. First of all, visit the official Railway Group D Website of RRB. Now you are at home page of the official Railway Exam website you will see a link “Exam Date”. Now, Click on that link and navigate to the next page. Here, you have to choose the zone. After that, your exam schedule will be displayed on the screen. Take a print out of the same.